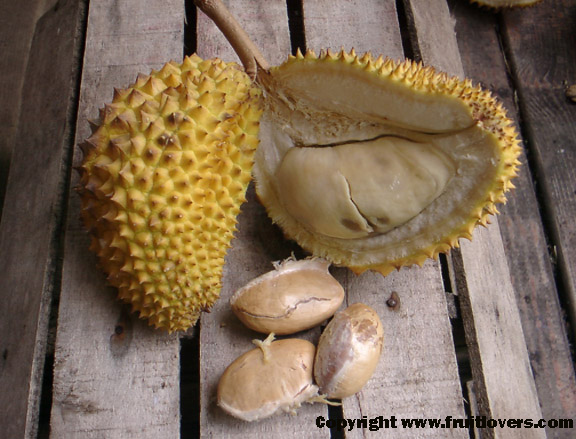 luvs food posted a Food Quiz and one of the questions had to do with the fruit called Durian. I have never tried it or even seen it, but have been very curious about it for a long time now. Has anyone here ever tried it or ever smelled it? What did you think? i haven't been able to find it but i'm definately curious. I've had it a few times at my fav Vietnames place in NYC. The owner likes me and gives me special tastes of exotic things. It smells really bad. IMO like a combo of garbage and gasoline. It tastes slightly less bad, nice texture, though. Nothing I'd buy or order in a restaurant. You can buy them fresh and frozen at the Super 88. If you have a good asian market, you've probably seen them. Big, round, with spines. If you're scared, but want a sample flavor, check out the durian flavored cookies or ice creams at your local Asian store. Here's a Durian - kinda cool! I just saw a recipe showcasing one of these - If I can find the magazine, I'll post the recipe. Pete Luckett, "The Food Hunter", had an episode 3-4 weeks ago where he encountered Durian. It's the first time I've ever seen him gag and spit something out. In fact, there was an obvious break in the filming so I'm sure there was some off-camera barfing associated with the experience, too. Think I'll add this to my "if I never try it it will be too soon" list. Can you compare the flavor to anything else? I have heard a lot of people compare it to rotten trash, but that is just a description of it being "gross". Is that really the flavor or is there any other flavor it might be closer to? Kinda reminds me of breadfruit.